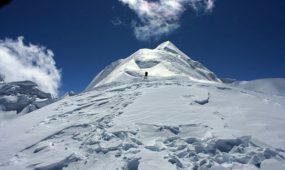 The Mera Peak Climbing is a delightful ascending adventure in a beautiful mountain called Mount Mera famous for this attractive looks and the views from the top. The Mera Peak is 6476 meters tall categorized as a trekking peak and has three peaks known as Mera North of 6476 m, Mera Central of 6461m and Mera South of 6065m. 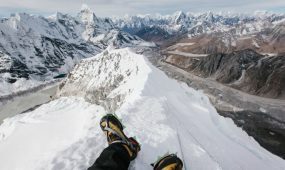 The Mera Peak Climbing is a straightforward climb for experienced climbers with the problem of proper acclimatization for new and general climbers. 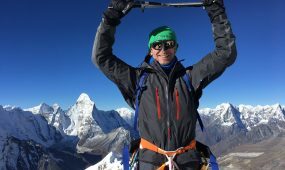 The climbers need to get trained in fitness and altitude training for Acute Mountain Sickness before trying for Mera Peak. The Mount Mera is beautiful and fascinating mountain with nearby and stunning views of all the mountains of Everest region from one single place mainly Everest, Makalu, Lhotse, Cho-Oyu along with other adjoining peaks. The Mera Peak Climbing takes the climbers to Lukla Airport from an air-light from Kathmandu city and final boarding at Namche bazar after 2days walking from Lukla Airport. 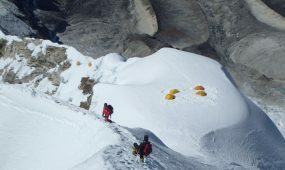 The climbers traverse through various local places like Chutanga, Thuli Kharka, Kothe, TTak Nak Khare before reaching Mera base camp. The Mera base camp is a beautiful place to camp and see nature which requires excellent physical fitness to overcome the altitude sickness issue. The trekking trail of hidden valley and unspoiled forest of Hinku Valley is one of the most beautiful locations of the earth. The climbers from Mera base camp further move towards High Camp at 5780 meters and finally reach the Mera Central Peak of 6461 meters. 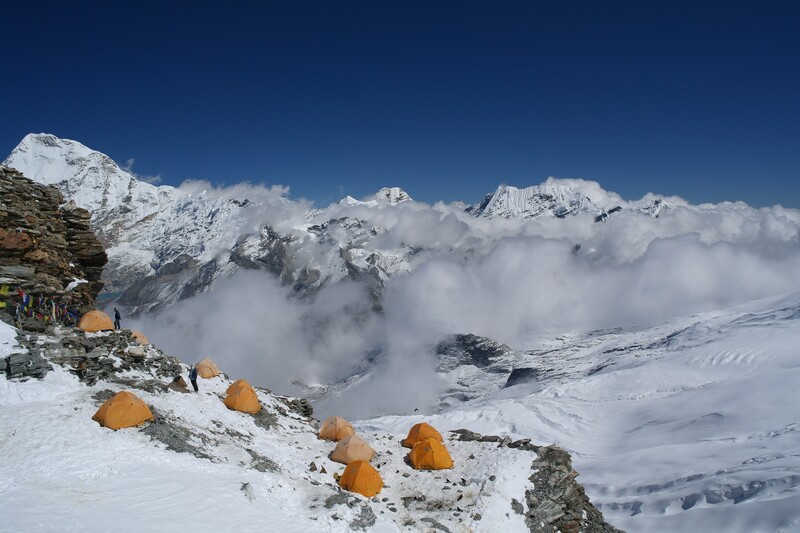 The climbers are rewarded with close by views of all mountains of Everest region from one single place. Namaste & welcome to Nepal Guide Info Team . While you landed at the Tribhuvan intl airport nepalguideinfo team representative welcomes you with your name and assists to transfer in your hotel in Kathmandu. After time to get refreshed, bring you at head office and briefing about the program and evening we’ll pick up you for welcome dinner in one of the typical Nepalese restaurant with cultural program in the heart of Kathmandu and overnight at Hotel. This morning you’ll be transferred to domestic airport and fly to Lukla. It takes 40 minutes scenic flight up to small airstrip to Tenzing-Hillary airport to Lukla and experience your first breakfasts in the mountains whilst the Nepal Guide Info Team organizes porters, while the guide sort and divide the load baggage to be carried by porters. We start our trek further an easy day through the woodland above Lukla. A good trail leads through pasture to the edge of a diminishing forest of rhododendron and pine which clothes the steep hillsides above Lukla. We make steady progress on a good trail, crossing ridges and streams up to ‘kharka’ used for grazing yaks where we’ll stop for 2 overnight at camp at Chutanga. This morning after a Himalayan breakfast at the camp we’ll have full day leisure at camp or spend a day walking up to a small grassy peak below the Zatra Teng Pass reaching an altitude of (4,000m/13,120ft). There are excellent views out over the valley of the Dudh (milk) Kosi (river), and also views of our route towards the Zatra La. We stroll back to our camp at Chutanga for the overnight. After a rest/acclimatization day at Chutanga we continue a long day walk around 6-7 hours crossing the Kalo Himal Ridge that separates the Khumbu from the Hinku valley that lead across this ridge is the Zatra La, traversing to the right and finally descending steeply to Tuli Kharka (big pasture) where there are several basic lodges. We make camp beside the lodges. Remainder time rest and relax at the camp after a long walk. Today, after a breakfast we continue our journey descending to Hinku valley of Gothey. This is a good place to camp and there are several tea houses around and you can visit and go and watch the local lifestyle in the remaining time and we’ll camp nearby the tea shops and overnight. The following day is another short day as you trek in the shadow of Mera Himal along the ridge of the Hinku Khola. The west bank of the Hinku Drangka northwards, we will take lunch at Gondia Hung, a summer herders’ settlement. Beyond Gondi Song we pass a 200 year-old Gompa built beneath a massive boulder, to burn some juniper at the shrine, an offering that just might ensure a successful ascent of Mera Peak. Thagnag is a summer grazing area with the simplest of lodges and shops starting to develop and we overnight in Thagnag. This morning after a breakfast, we prepare our gear for ice climbing (This may depends on season and availability of Ice if ice not available then we just hike around or rest) – just above the Khare and need to walk couple of hrs from where there are good views of the Mera La and the route up the mountain. This will also be a time for practicing few hrs Ice climbing and our leader will teach you and instruct about the climbing. After few hrs practicing at glacier, stroll back to camp and final preparation of our equipment and packing of our mountain bags and overnight. This is a big day, we wake up at 2.30 am around and after a breakfast, the group will put on crampons and rope up before setting out for the summit. 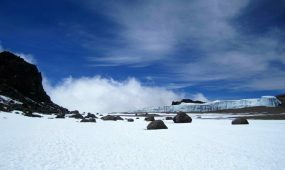 From the high camp a well acclimatized party will take 3 – 4 hours to the central summit of Mera peak. If time and conditions permit we may opt to make the traverse to the slightly higher north summit. This excursion adds 2 -3 hours to the day is of a more technical nature than the rest of the climb and the decision as to whether we attempt this will be taken by the trip leader. From the summit can be seen the magnificent views of Mt. Everest (8,848m/29,029ft), Cho-Oyu (8,201m/26,906ft), Lhotse (8,516m/27,940ft), Makalu (8,463m/27,766ft), Kangchenjunga (8,586m/28,169ft), Nuptse (7,855m/25,770ft), Lobuche (6,145m/20,160ft), Chamlang (7,319m/24,013ft) are spectacular from the summit. You then retrace your steps to Khare after the climb with a rest and some hot soup at high camp on the way down. A long but inspirational day! This day we most kept for the reserve day for the unforeseen condition as weather problem or weakness then you can take this day as your reserve day and if earlier back then you can take the rest somewhere else around. If already climb this day you can use for another Ice climbing day or spent one more night at village of Lukla. After a great success of the expedition to Mt. Mera we descending to Hinku valley to Gothey for our overnight stop at camp. Enjoy the evening with local wines or whatever you want to relax at the camp and overnight. Today, we again climb up through the lush forest on the west side of the Hinku Valley to Tuli Kharka below the Zatra La where we’ll stay overnight at camp. Today, we have a last day for the trek and we start to climb few hundreds meters to the Zatra La top will be our last climb of the trip. After the top we descending up to Lukla village where we concludes the trekking part and this evening enjoy with crews at the last dinner at the mountain and overnight at tea house. 18: Fly back to Kathmandu are schedule for morning normally, because of the wind in the afternoon, sometime the flight time can be delayed due to bad weather and other reason beyond our command. Anyway we will fly back to Kathmandu and your guide will transfer to hotel. You may have time to relax after long journey and take back your breath and rest at your hotel. Two nights standard accommodation in 2/3 star category hotel in Kathmandu located tourist center Thamel, or up to you. This list is a guideline to help you pack for trekking and peak climbing. Also, please understand that the items listed below will vary a little according to the season and the trek duration. Those items marked by an asterisk (*) are provided by Nepal Guide Info Team inclusive in the service. Remember that your luggage will be carried by your porter, but you are required to carry a day pack (with your valuables or anything important) on your own. We also suggest that you pack only what is necessary. Nepal Guide Info organized Mera Peak is one of the most alluring trekking peaks in Nepal as it involves a culturally stimulating journey through remote picturesque villages and forests – followed by a gentle climb to the summit. 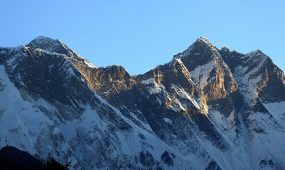 It is perhaps best known because it is Nepal’s highest trekking peak. The climb of Mera comes at the end of a week-long trekking and acclimatization programmer designed to give you the best possible chance of an enjoyable yet successful journey. The trip initiates in Kathmandu where we make preparations and enjoy the diversity of this ancient city before embarking on a flight into the town of Lukla in the Khumbu Valley, the entranceway to the Everest region.